A young boy records the ups and downs of life as a new big brother in a scrapbook of funny, earnest letters and other touching memorabilia. There's a baby on the way! Of course, Mike is very excited and curious about his new sibling. And he's very eager to assume his new role as a big brother. 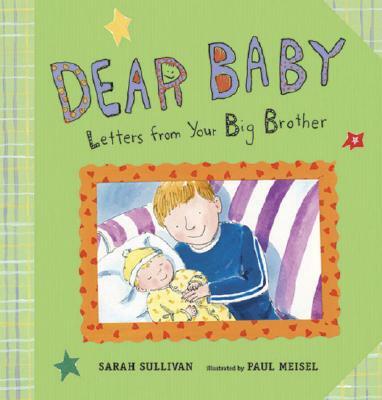 To start, he's decided to record his observations and experiences in a series of letters to the baby, displayed here along with playful illustrations of Mike's own drawings, family "snapshots," and even a sonogram. Whether Mike is feeling like an "invisible boy" or boasting of his new sister's talents, whether furious when she breaks his favorite toy or proud to save her from a hot curling iron, his account of his first year of life as an older brother evolves into a very special keepsake — and a funny, honest, and heartfelt tribute to sibling relationships. Sarah Sullivan is the author of the picture book ROOT BEER AND BANANA, illustrated by Greg Shed. Of DEAR BABY she says, "I always wondered how it would feel to have a younger brother or sister. My brother told me a little bit about how he felt when I came along. I suppose Mike's letters grew out of those conversations." The recipient of an MFA in Writing for Children from Vermont College, Sarah Sullivan writes from her home in West Virginia, where she lives with her husband and her cat. Paul Meisel is well known for his illustrations in more than thirty children's books, including WHAT'S THE MATTER IN MR. WHISKERS' ROOM? by Michael Elsohn Ross, WHAT'S THAT NOISE? by Michelle Edwards and Phyllis Root, the Cool Crazy Crickets books by David Elliott, and the LET'S-READ-AND-FIND-OUT science series. He says, "There is nothing better than having the opportunity to think and draw like a kid. Cut paper, markers, crayons — I had a ball!"